All Posts Tagged With: "Mercedes-Benz Fashion Week"
Talking Makeup and Marta Walsh has just found out Maybelline New York’s fashion week S/S 2011 lineup! 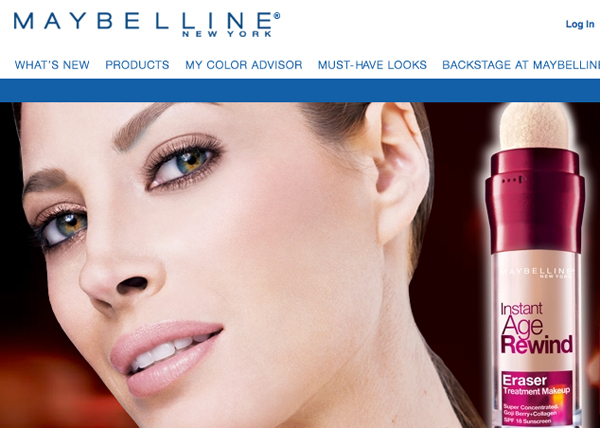 Maybelline New York, the official makeup sponsor of Mercedes-Benz Fashion Week in New York City’s Lincoln Center, will be creating runway makeup looks for the following shows: BCBG MAX AZRIA, Michael Angel, Vivienne Tam, Z Spoke by Zac Posen, DKNY, Custo Barcelona, Carlos Miele and L.A.M.B. Leading backstage teams will be the inspirational and sought after Charlotte Willer, Maybelline New York’s Global Makeup Artist. Carolina Herrera known for her sophisticated design and elegance receives the distinguished title of “Mercedes-Benz Presents” designer for this season’s spring/summer 2011 collection debuting on Monday, September 13th, 2010, at 10:00 am at Lincoln Center, the new home of Mercedes-Benz Fashion Week. Carolina Herrera has designed for many celebrities and high profile clients including Renée Zellweger, Amy Adams, Michelle Pfeiffer, Emily Blunt, Oprah Winfrey, and Camilla Belle. She joins a prestigious list of past “Mercedes-Benz Presents” designers including Monique Lhuillier, Badgley Mischka, Narciso Rodriguez, and CHADO Ralph Rucci. 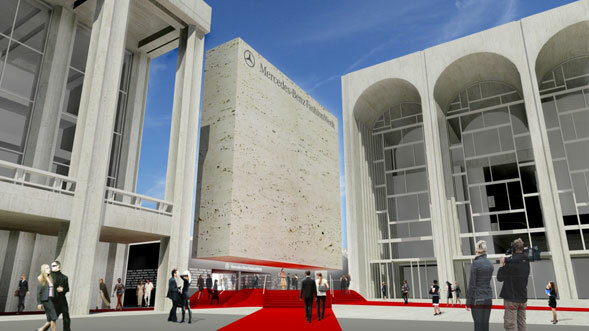 IMG announced today, April 29th, 2010, plans for its first season of Mercedes-Benz Fashion Week in Lincoln Center’s Damrosch Park at a fashion industry briefing supported by The City of New York, Lincoln Center and the Council of Fashion Designers of America. The move to Lincoln Center has allowed IMG Fashion to unveil event upgrades such as modernized production capabilities for designers, digital services concurrent with the advanced needs of the 21st Century, better accessibility for attendees through both public and private transportation and great resources/facilities on-site and in the surrounding areas. The move to Lincoln Center comes after extensive work between City Hall, Lincoln Center, the New York City Department of Parks and Recreation, New York City Economic Development Corporation (NYCEDC), IMG and the Council of Fashion Designers of America. Irina Shabayeva, the season six winner of Project Runway, debuted her Fall 2010 collection on Saturday, February 13th, 2010, during Mercedes-Benz Fashion Week at SIR Stage 37. Kate Bazazian has worked as the makeup key for Irina’s show and she talks to Talking Makeup about the makeup look and inspiration! “It went through a few different ones until we settled on what walked down the runway. The look started much softer in effect, but with the same ethereal earth tones. A few days before the show, Irina said to me “if we’re gonna make a statement, lets really make it” and that opened it up to a lot more to ideas I had floating around. The line itself was very inspired by flight and what better way to capture that than by making the makeup look as though it was put on by the quill of a feather as well. TRESemmé created three chic looks for Mercedes-Benz Fashion Week Spring 2010 in NYC. The Show: Whitney Eve. The Hairstyle: Fun and Flirty Textured Pony. 1. Apply TRESemmé 24 Hour Body Foaming Mousse to damp hair, and blow dry upside down using a round brush. 2. Spray hair with TRESemmé Thermal Creations Curl Activator Spray, and lightly curl with a 1” curling iron for texture. 3. Gently tease the top of the head towards the front of the hairline for volume. Using fingers, pull hair back into a ponytail towards the crown, and fasten with an elastic. 4. Create texture throughout the ponytail using hands, and finish with TRESemmé TRES Two Ultra Fine Mist Hairspray. Acclaimed fashion designer Thuy Diep selected MAKE UP FOR EVER to perfect her models’ faces at the Thuy Fall 2010 Fashion Show at the Salon in Bryant Park during Mercedes-Benz Fashion Week. MAKE UP FOR EVER ALLIANCE team member, Lottie www.makeupforever-alliance.com , served as key make up artist for the show, where she created a cool, fresh look to complement the vibrant jewel tones of the collection. Complexion & Cheeks: Lottie first applied HD Invisible Cover Foundation to perfect the models’ complexion. Next, she created a contour on the cheeks using Mat Bronze #2, and then applied more bronzer high on the apple of the cheeks. 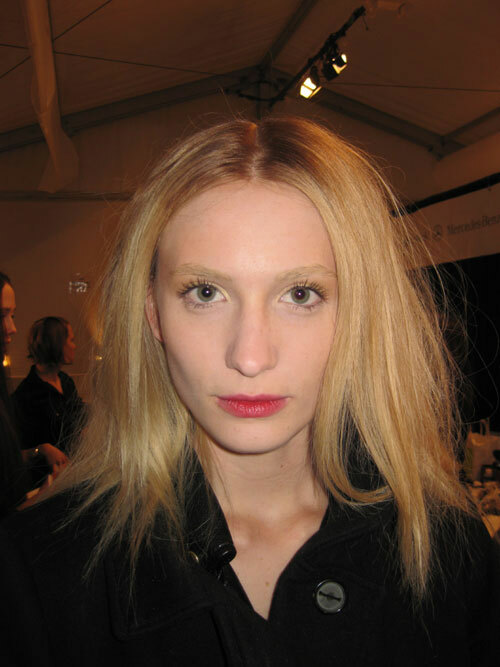 The look was set with Super Matte Loose Powder #12 on the t-zone. New York Fashion Week Fall Winter 2010: More fabulous celebrities spotted in the Mercedes-Benz Star Lounge or backstage at Mercedes-Benz Fashion Week. New York Fashion Week Fall Winter 2010: These are the fabulous celebrities spotted in the Mercedes-Benz Star Lounge or backstage at Mercedes-Benz Fashion Week. 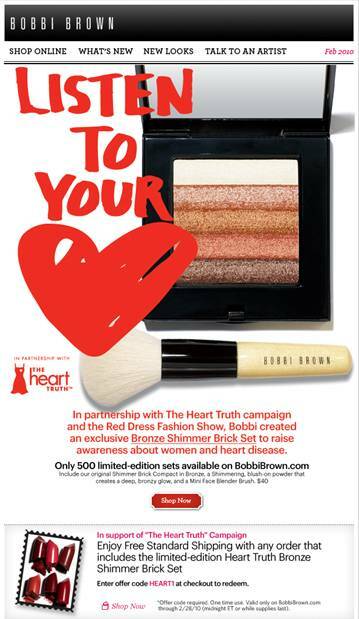 For the fifth year in a row, Bobbi Brown is proud to be a sponsor of the The Heart Truth’s Red Dress Collection 2010 Fashion Show. The show, which brings some of Hollywood’s leading ladies together on one runway, will be taking place on February 11th during Mercedes-Benz Fashion Week at “The Tent” at Bryant Park.